UPDATE: Lenovo has finally placed the Ultrabook Pro Keyboard on its website and the price is downright shocking. Yes, it's got a built-in battery that extends power for up to 12 hours, but for $399 more? No thanks Lenovo. Read it and weep. ORIGINAL POST: Just in time for your holiday shopping consideration, Lenovo has released the Wacom-penabled Thinkpad Helix 2, the first Intel Core M device I've had the chance to test. The Helix 2 comes in two flavors: a $1049 5Y10 model with 4 GB of RAM and 128 GB SSD and the $1499 5Y70 model with 8 GB and 256 GB storage. Both versions have an 11.6" FHD IPS LED display with a resolution of 1920x1080 and feature Intel HD Graphics 5300. Although the last thing I need is another Windows tablet, I couldn't resist the temptation and decided to purchase the low end version to see how it compared with the Surface Pro 3 and other devices in the SurfaceProArtist labs. The Helix 2 ships with the Ultrabook Keyboard, a cover that doubles as a stand but lacks a hinge mechanism. The typing experience on the keyboard is far superior to keyboard covers like the Surface Pro's, but the lack of a hinge, backlighting or Bluetooth severely limits the keyboard's functionality. The screen rests at only one angle that may be awkward to use in a cramped environment (see image above). And you have to be careful to dock and undock the screen just right to use the keyboard as a cover. You can't just fold and unfold it as you'd expect from any other keyboard. An Ultrabook Pro Keyboard will be available early next year. Lenovo doesn't offer a way to purchase the tablet separately, which adds an unnecessary expense to an already pricey purchase. As unboxings go, the Lenovo Thinkpad Helix 2 unveiling is pretty unmemorable. 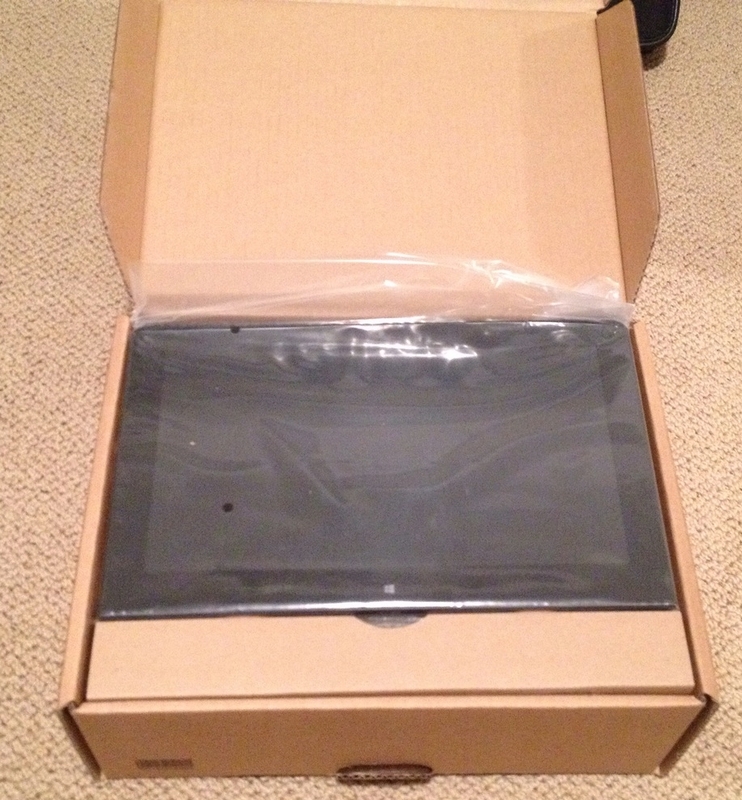 The tablet ships in a plain cardboard box, with no attention paid to first impressions. Contents are very sparse: the tablet, keyboard, power adapter and cord. I almost threw away the packaging before discovering that the pen was packed loosely in the very bottom of the box. The keyboard features a USB output (left). Also visible on the tablet is the power connector. The top of the tablet has a power switch (right) and an auto-rotation lock. The right side of the tablet includes (from right to left) a micro HDMI output, covered USB and SD ports, the volume button and headphone jacks. The opening in the keyboard is the pen silo. 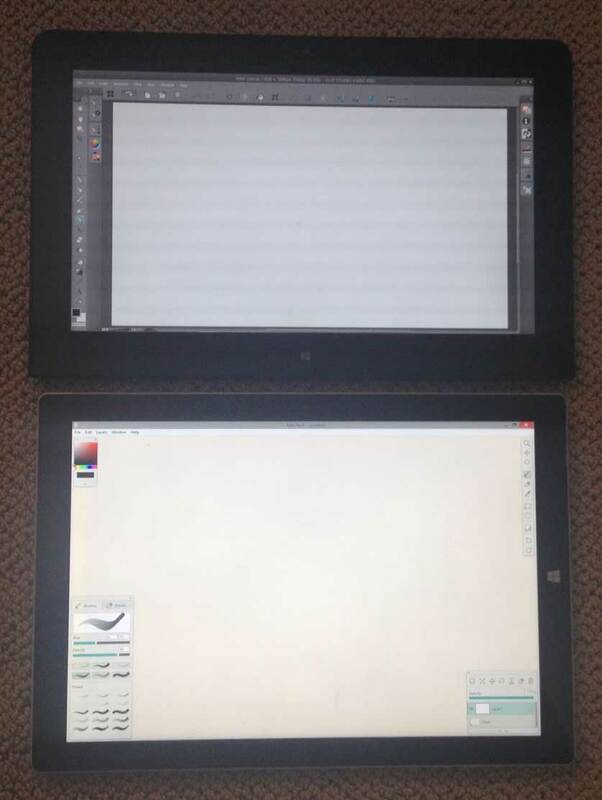 Although its screen is only 11.6-inches vs. the Surface Pro 3's 12.5 (above, bottom and below, right), the physical dimensions of the Helix 2 are nearly identical. 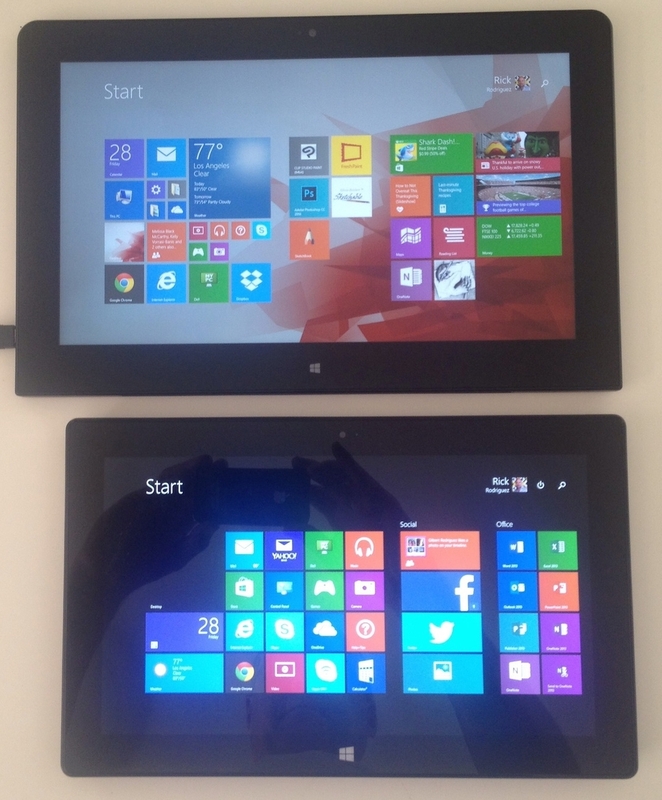 The screen size of the Helix 2 is significantly roomier than the Surface Pro 2 (above), and it's also thinner and lighter (below). I was expecting another Lenovo stylus like the one included with the Thinkpad Yoga (above top), but I was pleased to find that the Helix 2 includes a full-sized pen comparable to the Surface Pro 2 pen (third from top). The barrel is a bit narrower than I prefer, but it's very adequate for most uses. It ships with one Wacom flex nib, such as is found on the Fujitsu T-5000. The digitizer on my Helix 2 works exceptionally well. I can draw all the way to the edges, I have no problem accessing the corner menus or the close gadgets and the pen-cursor alignment is uniform throughout the screen. This is the first Wacom Windows tablet I've owned that has worked so well out of the box. My Helix 2 shipped with driver version 7.1.3-9 installed and I've decided not to update it until offered the option directly by Lenovo (if that ever happens). The latest driver on the Wacom US site is 7.2.0-10, but if it's not broken, why fix it? Drawing on the tablet is a wonderful experience. Unlike my Lenovo Thinkpad Yoga, the Helix 2 screen does not have a screen protector, but the pen's Flex nib offers all the grip that I need. Of course, the Helix 2 is compatible with all Wacom Tablet PC pens and I tested mine with the Bamboo Stylus Feel, Fujitsu T-5000 and many others with equally excellent results. I've tested the Helix 2 with the desktop applications Clip Studio Paint, Photoshop CC 2014 and Sketchbook Pro 7 and the apps Fresh Paint and Sketchable. The lower-end 5Y10 processor never broke a sweat. A major advantage of the Core M (formerly known as Broadwell) generation of chips is that they allow fanless designs. My Helix 2 has never heated up even while running graphics intensive benchmarks and the silent operation is welcome too. If you've been waiting for a Wacom-equipped successor to the Surface Pro 2, the Helix 2 comes very close to being that device. 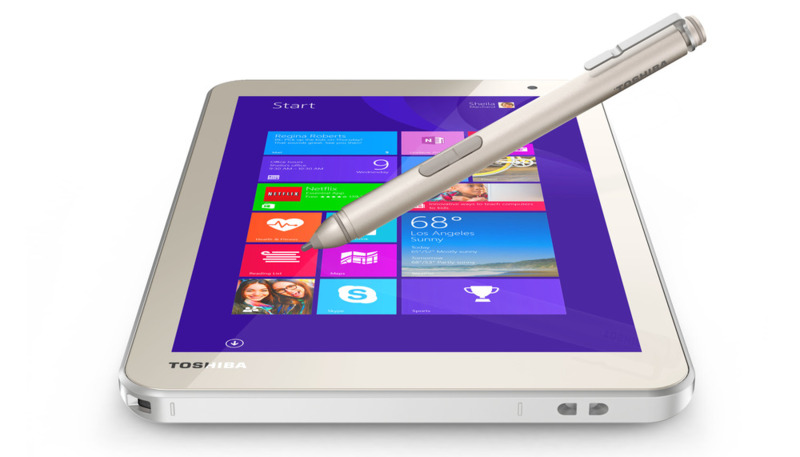 It certainly offers more of a true tablet form factor than the SP2. It's significantly thinner and lighter and doesn't throw off heat. On the other hand, there's something cheap-feeling about the Lenovo. The back is smooth and cool to the touch, but there are a few unsightly stickers and an unidentifiable protuberance by the SD slot that can be uncomfortable to hold. The hardware controls like the volume button are too close to the body and shallow, making them very difficult to distinguish from the USB and SD port covers. There is a sharp edge all around the tablet where the front panel comes in contact with the rest of the body that is less than ideal. The docking holes at the bottom of the display are also uncomfortable to the grip. The docking mechanism itself is somewhat finicky. You have to align the tablet "just so" for it to send power to the keyboard. It's also very easy for the screen to detach from the keyboard if you attempt to carry the Helix 2 while in the laptop mode. Lenovo should offer a standalone version of the Helix 2 priced around $800 to compete more directly with the Surface Pro 3 i3 model. Although the 11.6-inch, 16:9 HD display is not as nice as the SP3's 12.5-inch, 3:2 high-res display, it's close enough that Wacom aficionados would want to carefully consider the Helix 2. But for now, the Helix 2 is simply over-priced. My advice is to wait until the new year when the Ultrabook Pro Keyboard is available and run the price/performance comparison again.